Canohm, major importer and distributor of high-quality audio/visual products, is pleased to announce the arrival of Vanguard Dynamics VAIL Amp In-Wall Mounting Dock, with high performance stereo amplifier, for Amazon Echo Dot (2nd Generation). VAIL Amp system was introduced at CEDIA 2018 in San Diego, CA and is the all-new solution for integrating Amazon Echo Dot into your smart home solution. VAIL Amp is a small, flush-mounted, in-wall 60 watt amplifier featuring a secure dock for Amazon’s Echo Dot. It can power up to four architectural speakers (4ohm/8ohm switchable). The elegant design allows for Echo Dot to be placed at the level of an ordinary light switch for superior voice intelligibility and easy access to its touch controls. A square finish plate cover provides the final design aesthetic. Vanguard Dynamics, a DaVinci Group brand, is renowned for developing innovative products that interface with the best-known brands in the industry. With much excitement for, and high uptake of, Amazon Echo Dot for the home, VAIL AMP responds to the need for a high-performance stereo system that integrates Alexa seamlessly and professionally into any home. VAIL Amp enhances the features of Echo Dot by providing a superior way to leverage existing whole house capabilities such as multi-room party mode, whole house paging and whole house voice control. It’s fully contained in a single assembly requiring no “home run” to a remote location. Via simple connections it provides for DC voltage inputs from the included power supply and amplified speaker outputs to loudspeakers. The wall plate allows for secondary audio inputs and subwoofer outputs for full home audio performance. An ideal setup for your home entertainment system such as home theatre, music party, and even video games. VAIL Amp allows for either seamless switching between audio sources or ingeniously to play both at once. VAIL Amp becomes the ultimate single zone solution OR a powerful whole smart home solution. Because VAIL Amp is decentralised, it frees installers and designers from the burden of complex planning, design and installation that is associated with traditional distributed audio and automation systems. 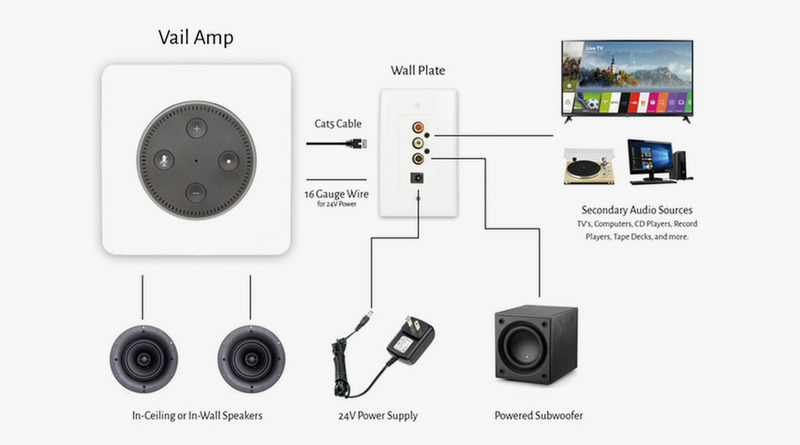 For consumers new to mounting solutions for Echo Dot, VAIL Amp system turns Amazon Echo Dot into an in-wall high-performance audio source. The small, fully continued amplified assembly firmly holds the Dot in an attractive wall dock that allows for accurate voice intelligibility and convenient light switch level access to the Dot’s surface controls. Its high-power amplifier can be connected to up to two pairs of any in-ceiling, in-wall or cabinet speakers. VAIL Amp becomes your in-wall volume control keypad, voice control, and streaming music source. Speak with Canohm’s team to learn more about stock availability and ordering via Canohm’s business development team or the Canohm online shop. Sangean DPR-67 To experience digital radio anywhere, anytime, just add colour!